Pienza, with spectacular views over the d'Orica Valley, was believed to be the perfect Renaissance city when it was created in 1459. It is a UNESCO World Heritage site and the entire valley was included in the list of World Cultural Landscapes. So we have decided to stay here for the first four nights of your tour. Ride: This is a warm-up ride to ease the legs and body into it. Some of you may have only recently stepped off a plane so this ride offers a great way to “tease” out any tiredness. Ride: We start the day with a wonderful downhill ride through amazing countryside to Radicofani, which dates back 1,00 years. It houses one of the most impressive fortresses in all of Tuscany. After a stroll around this hilltop town it is back on the bikes to the Pecorino chees factory for a tour and a light lunch. After which we finish the day with a climb back up to Pienza. Ride: A journey of classic Tuscany. Todays ride takes us from Pienza to Montecino via Bagno Vignoni, Casteglion d'orica and Stant'Antimo, where mass is still conducted via Gregorian chant. This abbey is one of the most precious remains of Romanesque architecture in Italy. According to ledgend, SantAmtimo was fonded by charlemange at the end of the 8th century. After visiting the abbey and a light lunch it is off to Montecino through a sea of vine yrads where Sangiovese grapes are grown for the famous Brunello do Montecino red wine. We will have a chance to taste Brunellos at the vineyard Le Ragnaie before dinner. 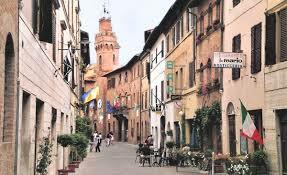 Castellina is still a very active village with locals and tourists mingling in the small narrow streets. Before dinner we will enjoy wine tasting at Casa Emma where varieties such as Merlot are grown. The ride today will take us through the Chianti hills. We will visit Gaiole, famous for being the start of the Eroica Race, where the race is done on vintage bikes and unsealed roads. We will visit the bike museum and wander the village. Ride: This is a beautiful ride, leaving Castellina we will cycle past Monteriggioni, literally a town in a castle, as we make our way to Sam Gimignano. The castle is barely 200 meters across and its 80 residents all reside within the picture perfect round turrented walls. More vine yards await us today but you will be amazed at how different they look once we get in to the district of SanGimignano. Also know as the City of Towers, it was formed around the 18th century and at one time home to more than 15,000 people.